In 1690 the East India Company was granted a trading licence by the Nawab of Bengal for three villages on the East bank of the Hooghly river. By 1780, the company had transformed the villages into Calcutta, a small English city. Musicians travelled from London to India, bringing the music of Handel, Corelli and others, whilst others played their harpsichords with Indian classical musicians, and transcribed Indian music into European notation. It is this musical melting pot which Ensemble Tempus Fugit, director Katie de la Matter, is planning to explore in their programme Calcutta at the Brighton Early Music Festival on 5 November 2017, with further performances at Tara Arts Theatre in 2018. The material is completely fascinating, including Western transcriptions of Hindu and Bengali music (done often at the behest of the wives of English residents), as well as local Indian versions songs. 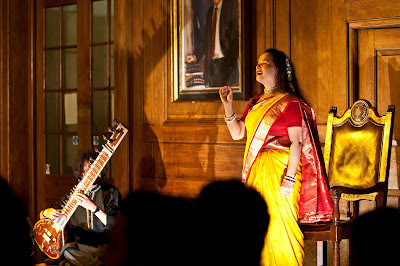 The performers include James Hall (counter-tenor), Debipriya Sircar (Indian classical vocalist), Sanjay Guha (sitar), Jamie Akers (lutes), Emily Baines (early wind), Lucia Capellaro (Baroque cello) George Clifford (violin) Katie De La Matter (harpsichord & creative direction). And the ensemble will meld this unusual combination of instruments and traditions, with period music, Indian song, puppetry and drama to tell the story of music melting pot on the streets and at the soirées of Calcutta. The group is crowd-funding for the project (see their page at Crowdfunder.co.uk), and below is their crowd-funding video.